Basil (Ocimum basilicum) is a bushy, annual herb that thrives in warm, tropical climates. The name “basil” comes from the Greek word “basilikohn” which means “royal” or “kingly”, a reflection of their reverence towards the herb. Though it’s disputed whether basil was first grown in India or Africa, both cultures have extensively used this herb for several millennia. Today, there are over a hundred varieties of basil being grown in several countries for culinary and herbal purposes. The manganese present in basil can promote a healthy digestive tract. Manganese aids the digestive tract by helping it absorb fats and vitamins better, as well as preventing gastrointestinal disorders like constipation and irritable bowel syndrome. Furthermore, low levels of manganese were found to be associated with premenstrual syndrome (PMS), so basil can be used to soothe the pains of this condition. Basil has nutrients that are essential to a healthy heart. Magnesium relaxes blood vessels and improves blood flow, while vitamin A reduces the effects of free radical damage on blood vessel walls and the blood stream. Basil leaves contain vicenin and orientin, both of which are flavonoids that defend cell structures and chromosomes from deterioration. This herb is rich with the antioxidants vitamin C and vitamin A too, with vitamin C acting as a very effective counter against oxidative damage. Specifically, these vitamins can keep the eyes healthy and well, minimizing the chances of developing cataracts or macular degeneration. Since basil has mild antiseptic effects, a tea made from brewed basil can be taken to relieve nausea. As an excellent source of vitamin K and iron, basil can contribute to healthy blood and bones. Vitamin K, in particular, has an important role in blood clotting and bone mineralization. Even though there are multiple types of basil, only a few are usually incorporated into cooking. 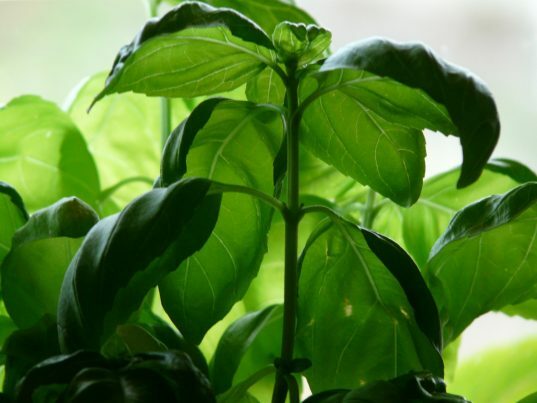 The most commonly-used culinary basil varieties are: Sweet Genovese, Thai basil, and Purple Opal basil. All of them can be used to enhance any recipe, whether it be a summer salad or a cold pasta dish. Basil is a core component of pesto, a popular Italian sauce and condiment that is often mixed with pastas or spread on toast. Note: It’s best to add basil when the recipe has neared completion. This is to keep the scent, flavor, and nutrients intact as prolonged exposure to heat will cause the basil to lose its essential oils. Basil promotes a healthy digestive tract. It prevents certain gastrointestinal disorders like constipation and irritable bowel syndrome and soothes the pain associated with premenstrual syndrome. Basil contains nutrients that promote a healthy heart. Basil leaves protect cells structures from deteriorating. The herb contains high levels of vitamins C and A. Basil can prevent the development of cataracts or macular degeneration. Basil is a mild antiseptic and can be used to relieve nausea. Basil is also an excellent source of vitamin K and iron.